Develop and implement a policy on discrimination and harassment. You can adapt the Discrimination and harassment policy template to your workplace. Establish a process for responding to any complaints about discrimination and harassment that may arise. The Good practice guidelines for internal complaint processes can help. Make sure staff are aware of your policies and processes regarding discrimination and harassment. You could do this by providing this information to new staff on commencement, promoting it on staff noticeboards and/or circulating it on your intranet. Provide training for your staff on their rights and responsibilities regarding discrimination and harassment in the workplace. If you don’t have sufficient resources to train all staff, focus on those in management and human resources roles. Options for low-cost training are available in most states and territories. 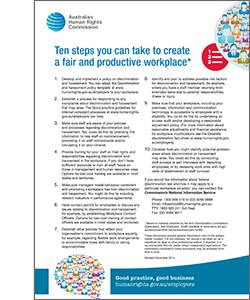 Make sure managers model behaviour consistent with promoting a workplace free from discrimination and harassment. You might do this by including relevant indicators in performance agreements. Have contact point/s for employees to discuss any issues relating to discrimination and harassment, for example, by establishing Workplace Contact Officers. Options for low-cost training of contact officers are available in most states and territories. Establish other policies that reflect your organisation’s commitment to workplace equality, for example, regarding flexible work arrangements to accommodate those with family or caring responsibilities. Identify and plan to address possible risk factors for discrimination and harassment, for example, where you have a staff member returning from extended leave due to parental responsibilities, illness or injury. Make sure that your workplace, including your premises, information and communication technology, is accessible to employees with a disability. You could do this by undertaking an access audit and/or developing a reasonable adjustment policy. (For more information about reasonable adjustments and financial assistance for workplace modifications see the Disability discrimination fact sheet). Consider how you might identify potential problem areas where discrimination or harassment may arise. You could do this by conducting staff surveys or exit interviews with departing employees, or by reviewing work units with high rates of absenteeism or staff turnover. Based on material provided by the Anti-Discrimination Commission Queensland. See Employers’ Toolkit available at www.adcq.qld.gov.au/resources/other-resources/employers-toolkit.